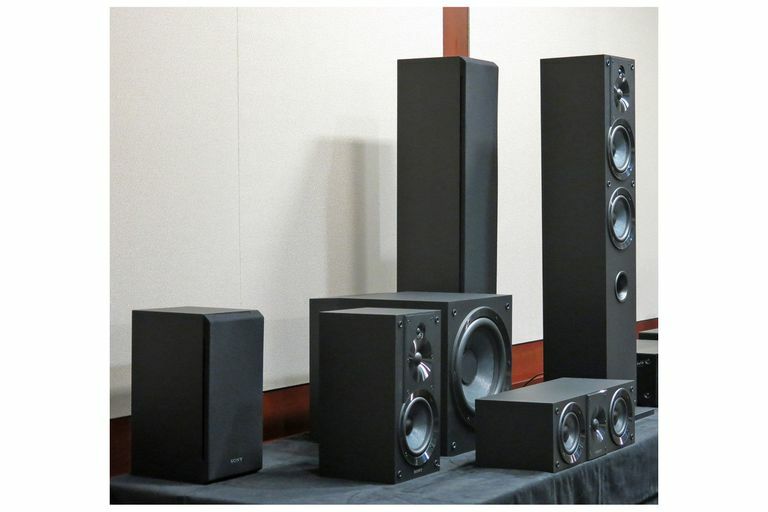 At a press event at Sony’s Rancho Bernardo, California (San Diego area) headquarters, the company had announced the first update to its low-priced core speaker line. Sony representatives weren’t shy about admitting that they’re going after a piece of the “inexpensive yet surprisingly good-sounding speaker” market now dominated by the competition, such as Andrew Jones-designed Pioneer products (e.g. the acclaimed SP-BS22LR). The CS line of Sony's speakers are more expensive than those made by Pioneer. However, they are larger and certainly look far more capable. The Sony CS speaker line comprises four distinct models, as detailed below. Together, they make up a traditional 5.1 speaker system, each sporting Sony's new "High-Res Audio" logo. The SS-CS3 tower speaker and SS-CS5 minispeaker are noteworthy for their supertweeters, which are designed with intent to reproduce the extended high-frequency (treble) content found in high-resolution music downloads (particularly the ones Sony happens to be pushing in tandem with its High-Res Audio). Sony rates the supertweeters' high-frequency response at 50 kHz, which is far above the commonly accepted limit of human hearing at 20 kHz. Whether or not you can actually detect these ultrasonic frequencies in any meaningful way remains a matter of debate among audio experts. That being said, the supertweeters may have added beneficial effects by reducing phase shift at high frequencies. To control the vibrations in the CS-series speaker line, Sony’s engineers carefully measured the vibrations in each part of each enclosure, then reinforced these affected areas to minimize the vibrations. This method proves to be a far more targeted and scientific technique than the “throw in a little bit of extra bracing (or none) wherever and hope for the best” approach that is oftentimes seen or done with inexpensive speakers. But this method also allowed the engineers to apply only as much extra bracing as needed, thus reducing the total amount of materials used, which helps to reduce shipping costs (certainly a bonus). In a brief demo at the event, the CS-series speakers sounded quite good. When we hear demos of inexpensive speakers, we always move our heads to either side and then up and down. This allows us to better gauge how broadly and evenly the speaker disperses sound. Most inexpensive speakers you can get tend to flunk this test badly. Because of their primitive crossover circuits, inexpensive speakers filter little or none of the treble out of the woofer. And because of the woofer’s large size, this tends to “beam” higher frequencies directly at you rather than broadly dispersing them throughout the room. This is why inexpensive speakers can sound incredibly different, even if all you do is just move your head a couple of feet to the right or left. As we moved our heads around and shuffled positions, we were encouraged by Sony's presentation. We could barely hear any changes in the sound output by the SS-CS3 tower speaker, SS-CS5 minispeaker, and SS-CS8 center speaker, which suggested that Sony didn’t cheap out too much on the crossovers. The sound overall was natural, clear, and fairly dynamic. The only aspect we felt like we missed out on was that the listening level wasn’t loud enough to hear what these speakers can really do. Sometimes you just have to crank it to see where the limits go!